One such way is by by employing a Toxin-Antitoxin (TA) system. These systems have been well characterised in plasmids that exist in a variety of different bacteria, but the example I’m using today comes from a rather large ICE called ‘SXT’, which is found in Vibrio cholera, the bacteria that causes Cholera. Such genetic elements are of concern in V. cholera as another such genetic parasite, a bacteriophage called CTX (which also inserts itself into the chromosome of the bacteria), is responsible for carrying the potent cholera toxin gene, thus converting a relatively harmless bacteria into a killer of millions worldwide. For its own sins, SXT encodes resistance to several antibiotics, and represents a means by which the rapid treatment of cholera can be impeded by acquired antibiotic resistance. But what is a toxin-antitoxin system? 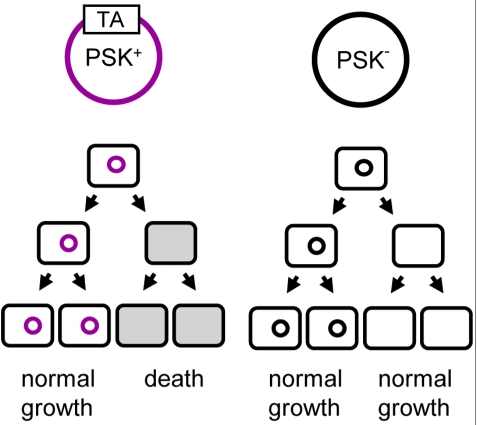 The schematic on the left, from a accompanying paper in the same issue of PLos Genetics, essentially shows that in the presence of a TA system, cells that lose the genetic parasite encoding the TA die, a phenomenon called post segregational killing (PSK). In a paper from the laboratory of Matt Waldor (Tufts University, Boston), Rachel Wozniak has identified a toxin-antitoxin system in SXT, the first time that a TA system has been shown to promote ICE maintenance. SXT encodes a toxin gene (mosT) producing a toxin that impairs cell growth, it also encodes an antitoxin that neutralises the effect of the toxin (mosA). Thus, whilst both mosA and mosT continue to co-exist, all is well. However, if SXT is ever to cut itself free and mail a copy of itself to another cell, which it may do when its current cell becomes stressed, it needs to free itself from the chromosome and form a separate circular strand of DNA. At this point, because it cannot produce more of itself whilst on its own, it could be lost when the cell divides. In other TA systems, the toxin molecule is relatively stable and long-lived, whereas the antitoxin is unstable, therefore relatively short-lived. So, in the absence of a fresh supply of antitoxin, there is sufficient toxin remaining to cause damage to the cell. This pairing of toxin and antitoxin is sometimes referred to as an addiction module, with cells becoming dependent on the continued presence of genetic element as a result. For this reason, despite SXT cutting itself free of the host chromosome in more than 1 in 100 cells, and so becoming vulnerable to loss, it is in fact only lost in 1 in 100 million cells. Most antibiotics also travel around on plasmids containing their own resistance. I’ve always thought of it more as a survival mechanism for deadly bits of DNA rather than an addiction-fostering system for the whole plasmid. Either way, it seems to be a very successful survival technique.